Speer Lawman 9mm Luger Ammo 115 Grain Total Metal Jacket for sale online at cheap discount prices with free shipping available on bulk 9mm Luger ammunition only at our online store TargetSportsUSA.com. Target Sports USA carries the entire line of Speer Lawman ammunition for sale online with free shipping on bulk ammo including this Speer Lawman 9mm Luger Ammo 115 Grain Total Metal Jacket. Speer Lawman 9mm Luger Ammo 115 Grain Total Metal Jacket ammo review offers the following information; Developed as a dual line for both law enforcement and sports shooters 35 years ago, the Lawman line has been earning its well-deserved status with its reliable, durable and superior preforming handgun ammunition. Speer Lawman completed its 9mm Luger ammunition to be Total Metal Jacket or orthodox Full Metal Jacket depending on the product. Settled in Lewiston, ID, Speer ammunition has been synonymous with safety for Law Enforcement for years and the Lawman line built the reputation line from the ground up! Without a doubt, Speer Lawman remains the best choice and this is the best quality law enforcement on the market- period. This Speer Lawman 9mm Luger ammunition is loaded with a 115 grain Total Metal Jacket bullet. Speer Lawman completed its 9mm Luger ammunition to be Total Metal Jacket or orthodox Full Metal Jacket depending on the product. The Total Metal Jacket bullet is the perfect pick for target shooting, training, or out for the day plinking away at the range. This 9mm Luger ammo offers a muzzle velocity of 1200 feet per second and a muzzle energy of 367 ft lbs. 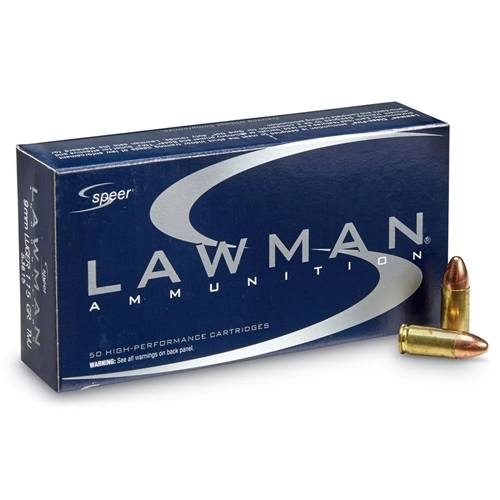 Speer Lawman packages this 9mm Luger ammo in boxes of 50 rounds and cases of 1000 rounds. 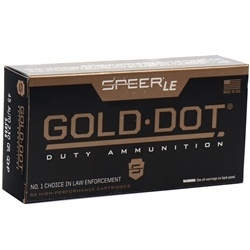 Order a case of bulk 9mm Luger ammo by Speer Lawman, receive free shipping from Target Sports USA. Several of the boxes had corroded casings. Would not buy again. Reliable, very reasonably priced ammo. As usual, Targetsports is my go-to place for all my ammo needs. The free shipping with case purchase is great.